110 pages | 20 B/W Illus. In 1935, the Russian-born Jewish architect Berthold Lubetkin and his firm Tecton designed Highpoint, a block of flats in London, which Le Corbusier called ‘revolutionary’. Three years later, Lubetkin completed a companion design. Yet Highpoint II felt very different, and the sense that the ideals of modernism had been abandoned seemed hard to dispute. Had modern architecture failed to take root in England? This book challenges the belief that English architecture was on hiatus during the 1930s. Using Highpoint II as a springboard, Deborah Lewittes takes us on a journey through the defining moments of modern English architecture – the ‘high points’ of the period surrounding Highpoint II. Drawing on Lubetkin’s work and his writings, the book argues that he advanced influential, lasting theories which were rooted in his design for Highpoint II. 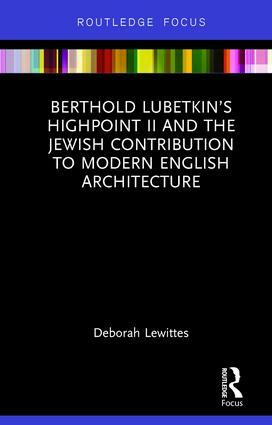 Lubetkin’s work is explored within the context of wider Jewish emigration to London during the interwar years as well as the anti-Semitism that pervaded Britain during the 1930s. As Lewittes demonstrates, this decade was anything but quiet. Providing a new perspective on twentieth-century English architecture, this book is of interest to students and scholars in architectural history, urban studies, Jewish studies, and related fields. Deborah Lewittes is an Assistant Professor of Art History at the City University of New York, USA. She has been a research fellow at the Courtauld Institute, London, UK, and Tufts University, Massachusetts, USA, and was a Lecturer at the Parsons School of Design at The New School, New York, USA.